The Nile Soft-shell is a member of an unusual group that retains only a loose framework of internal connecting bones within the shell: the outside plates or scales have become completely lost, hence the name. Soft-shelled turtles are excellent swimmers, and various species range over the rivers and lakes of the North American continent while others, such as the species illustrated, are found in Africa, along the Mediterranean, and through southern Asia. Their flattened bodies excellently adapt these animals to life on the bottoms of water courses. They often hide in shallow mud and sand banks, breathing by extending their long neck to the surface with only the snorkel-like nasal tips and possibly the protuberant eyes emerging when they take a breath. Most soft-shells are very effective predators, and the head shoots forth to grab the prey. 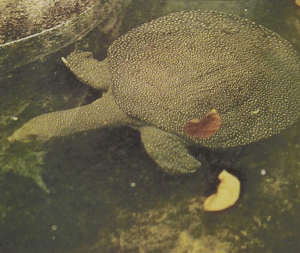 These animals can exchange some gases via their cloaca, which makes them susceptible to some of the respiratory poisons used to remove “trash fish” from rivers and reservoirs.